How to Choose the Best Coffee Subscription? Do you believe you can enjoy coffee shop quality beverages in the comfort of your home? And you don’t even have to leave the house to buy coffee beans. How is it possible, you may ask? With the best online coffee subscription services I’ve prepared for you today. They will pick coffee and deliver it right to your doorstep. All you have to do is brew and enjoy! The popularity of subscription services has been growing by more than 100% every year for the last 5 years. Coffee subscription boxes are among the most popular, alongside beauty products and food. The way subscription services work is quite simple. You choose the product (coffee beans, their blend, roast level, etc. ), schedule the delivery (the companies usually deliver coffee either weekly or monthly), and have it shipped to you regularly. Of course, you also need to set up the payment method. Typically, the subscription fee would be withdrawn from your account every month. 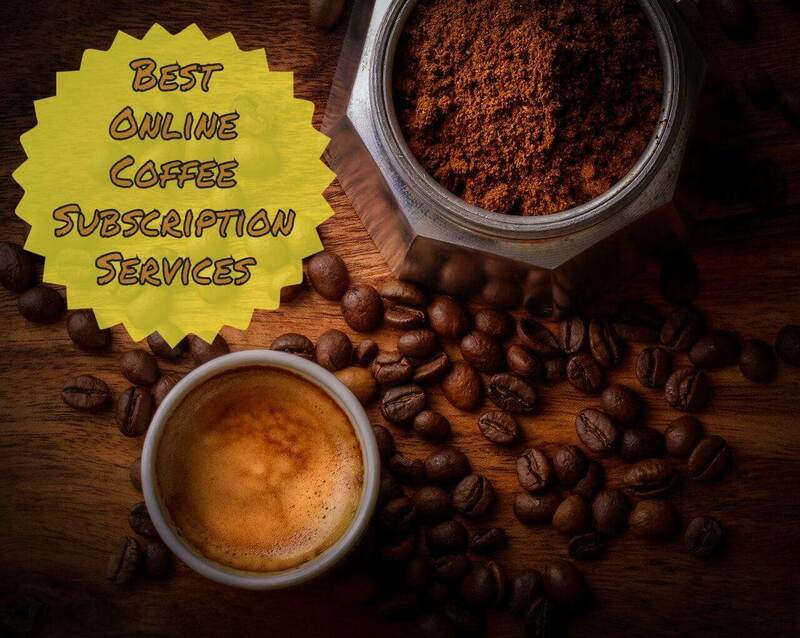 What’s special about coffee subscription services? Well, the thing is that they not only offer freshly roasted beans on a regular basis but also educate their customers about coffee (e.g., the differences between various bean types and roasts, how to recognize and enjoy the subtle flavor notes, etc.). They have a passion to turn their clients into more cultured coffee drinkers. Always fresh coffee. Typically, subscription companies send coffee beans that were roasted the day before. And they usually deliver your box within the first 48 hours. This means you get the freshest product. You can’t say the same about the grocery store coffee (or even the beans used in your favorite coffee shop, as you don’t really know when they were roasted). Convenience. Your coffee gets delivered to your doorstep, which means you can stop running to coffee houses or grocery stores when you’re out of it. And because the deliveries are regular, you aren’t likely to spend even a day without your favorite beverage – there will always be coffee beans in your house. Countless options. Subscription boxes offer various bean origin types, roasts, and interesting blends. They often pick something specific for each user or send different samples every month. This means you get to try numerous coffee types outside what you’re used to and explore the coffee world more. Good value. When talking about the coffee cost per cup, getting a subscription is definitely cheaper than buying from your local grocery or coffee shops. You can also save on driving to those places since you will get coffee delivered to you. And overall, subscription companies typically offer lower prices. They cut out the middleman and the physical store operation, which means you get cheaper coffee (on average, 15% cheaper than in stores and coffee shops). 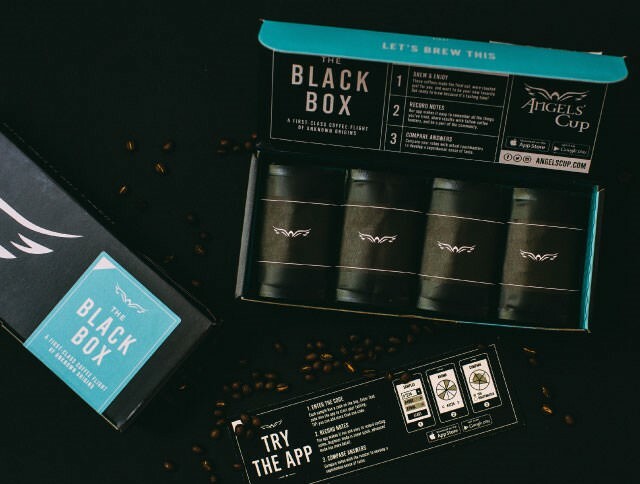 Bean Box is one of the most popular coffee subscription services (and one of the oldest). Once you become a member of their Coffee of the Month Club, you will get fresh gourmet beans delivered to your doorstep monthly. Until recently, the company used to work exclusively with Seattle’s roasters, which are famous for their leading coffee beans. But now, they have added Portland-roasted beans to the website and offer free trial boxes to their customers. Because Bean Box ships from Seattle only, you get a very specific set of beans. Which means it’s not the most flexible service, as many coffee subscription box reviews note. Still, you do have multiple options. The most popular is, of course, the Coffee of the Month set, which includes a 12-ounce bag of beans, some brewing tips, flavor description, and complimentary chocolate. Another popular option is the Bean Box Coffee Sample, which has four 1.8-ounce bags of best-selling beans. Buying freshly roasted coffee guarantees richer aroma, bolder flavor, and a larger number of healthy antioxidants. You get to choose from 5 roast types, including decaf, which is great news for people who watch their caffeine intake. You can also order a specific coffee type among the ones presented on the Bean Box website. What’s special about Bean Box is that they choose very specific coffee sourcing from the well-known roasters in the artisan coffee world. Besides, the company ships the beans within the first 2 days of roasting. And the shipping is free across the US, by the way. Sudden Coffee truly is a unique monthly coffee box service. It offers high-quality instant coffee made with brewed, hand-picked beans (100% Arabica) and freeze-dried in small batches for the best flavor and quality. With Sudden Coffee, you get new bean type every quarter. You can pick between two roast levels (Medium and Light). Plus, you have 3 packaging options: 8-cup, 24-cup, and 48-cup. The company uses recyclable materials for their packaging and sources their coffee from small, ethical farms. What makes Sudden Coffee even more special is that they don’t use any chemicals or preservatives in the process. This means you get instant coffee that is natural, flavorful, and delicious. 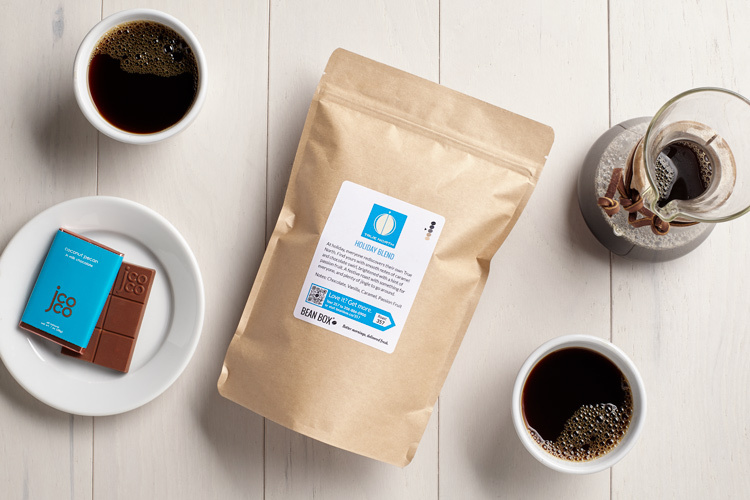 The company strives to make coffee simpler for their users without sacrificing the quality. You don’t even have to worry about brewing without a coffee maker if you don’t have one. You get fresh coffee and need only a mug and some hot water to enjoy a beverage that tastes like it’s from a coffee shop. 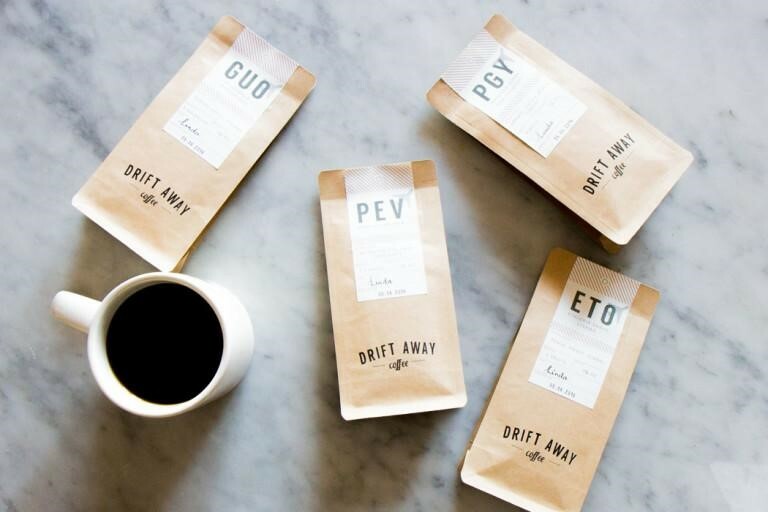 Ideal for people who appreciate customization, the Drift Away subscription service offers a personalized approach to your every cup of coffee. The company sends you a tasting kit of different coffees first. This helps users figure out what they like. Once you pick the type you prefer, the company will customize your coffee and match what they send to your personal preferences. You can receive your fresh coffee every week, every two weeks, or monthly. There are 14-cup and 22-cup packaging options available. Depending on the plan you choose, you can also get free priority shipping. It usually takes around 3 business days for the company to deliver your box. Drift Away ships the beans within the first 12 hours after roasting. This is one of the freshest subscription options you can try. Besides, the company works with their own app that helps them get to know their users and select only the best coffee according to their personal preferences. The company was founded by a young couple who experienced the urge to create something out of their passion for coffee. They learned everything about coffee themselves, experimented, and finally decided to start a coffee subscription service. Another cool thing is that every box comes with a story behind each coffee type. This helps users learn more about their favorite beverage and become more educated coffee enthusiasts. Also, Drift Away sends reminders 12 hours before each renewal, thus giving you a chance to make the last changes in your coffee plan. Great quality coffee and a whole coffee tasting experience. You see, Angel’s cup offers their customers unlabeled coffee samples (a pack of four, 2-cup or 5-cup each, depending on the box you pick). Users taste the coffee and use the company’s free app to write down the flavor notes they’ve tasted. Then, they can compare their answers with professionals and experts. Such interactivity does a couple of things. First, users get to learn about different coffee types, flavors, and how those are affected by brewing and other factors. Second, this is a really fun way to enjoy your daily cup of coffee. You can also get a 22-cup package of the most popular coffee beans, which the company picks every week based on sales analysis and customer reviews of their coffee boxes. 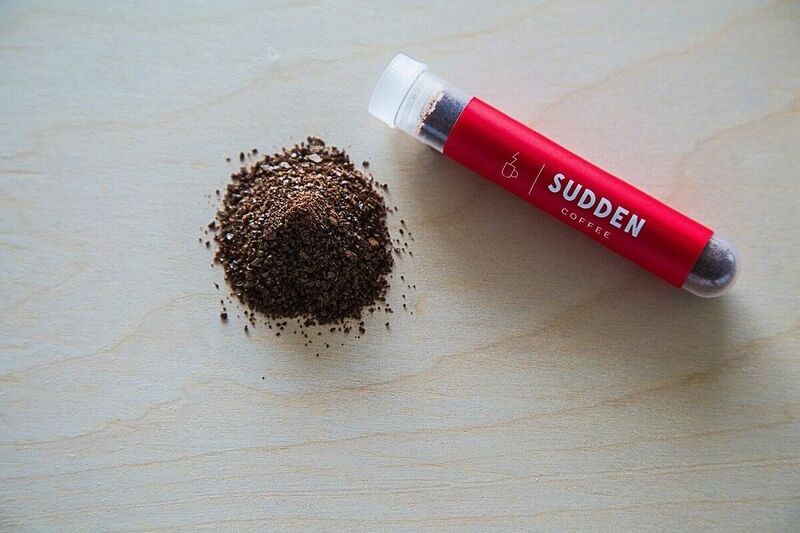 If you don’t have a grinder at home, you can get ground coffee in your Angel’s Cup box. There are coarse and fine grind options available. And while there are only three options (two blind test sets and one single-bean package), users eventually get to try more than 200 kinds of coffee. Angel’s Cup mixes and matches, tries 2-3 roasters in each tasting, combines medium and light roasts, and experiments with flavors. It’s a perfect option for people who are curious about coffee and want their experience to be rich and diverse. So, now you surely want to enjoy the benefits of coffee box subscriptions yourself. No wonder! By how do you pick just one? Look at the coffee beans the company offers. Read up on their sourcing. It is better to choose companies that offer 100% Arabica. Many users prefer single-origin coffee, so you might want to inquire about the country of origin too. Think about how much coffee you usually drink. And based on that, look at the company’s delivery options. Do you want a new batch every week, or once a month is okay for you? Thankfully, subscription services offer many delivery options these days, so you just need to find that one that works for you. Consider your budget. Of course, good coffee is costly. But if you have a limited budget, you can get smaller packages. And finally, think about your personal preferences. After all, it all comes down to what you personally want. Is it experimenting with different flavors? Then pick a company that offers interesting blends or blind testing. Is it customization? Then order from a company that will find a perfect mix based on your preferences. And if you don’t really know what you want, you can always get a pack of samples to figure out what flavors you prefer. The options are endless, really. How often do you drink coffee? Do you enjoy making it at home? And do you think using a subscription service could help you enjoy better quality coffee? Let us know what you think in the comments below!